We have ignitors, also known as electrodes, for many common oil burners. You will also find tune-up kits for Beckett, Carlin, Wayne and Weil-McLain burners, as well as a gauge to properly set your ignitors. Ignitor measurements are given as the length of the white porcelain body, by the diameter of the porcelain, by the length of the electrode wire from the porcelain to the tip. 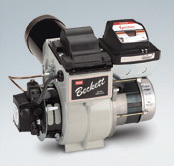 For more helpful information please check out our oil furnace Blog.This contains information such as, changing a nozzle, nozzle filters, noisy oil pumps, oil pump strainers & electrode adjustment. Also you could view our How to set Electrodes Video. Can't find your electrodes? Visit our electrode help page.